RainSaucer - Can I collect Dew, Frost, Snow, or Fog? Can I collect Dew, Frost, Snow, or Fog? 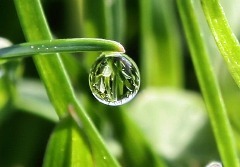 Dew and Frost: the amounts are not significant for plant watering purposes. At best, the surface of the RainSaucer™ may retain a cup of water per day resulting from the changes in temperature. But this cup will not fall easily into the middle. You still need a squeegee to stimulate the process. And in the case of frost, you also have to wait for it to melt in the sun. A cup a day is not significant but in the event of an emergency , it could be a real lifesaver. Snow: in small amounts is OK but too much can potentially damage the product so it is not advised unless the water is needed in an emergency or disaster. Fog: results in Dew when it touches cold surfaces. So the above advice applies. However, we are very interested in methods which will increase the amount of Fog our system can turn into Dew. Stay tuned for more developments in this area.